Masdevallias and Draculas grow throughout Central and South America and can be found as far north as southern Mexico and southward to Peru. They are, for the most part, cool growers and can be found at high elevations in the mountainous cloud forests where they thrive on the high humidity. Some grow right at the snowline; it is not uncommon to see them become lightly dusted with fast melting snow. Still others grow in warmer and somewhat drier conditions where the plants do get some drying between rains. The colors and flower shapes are mind-boggling. Some of the hybrids have been found to have more vigor, making them easier to grow and bloom while retaining the intriguing colors and shapes. 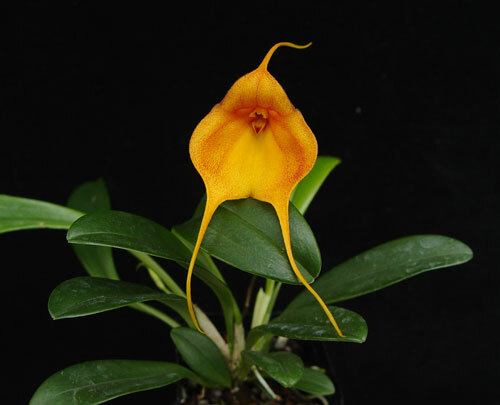 There are a few Masdevallias that do well in warmer areas where summer night temperatures infrequently fall below 68-70 degrees F. They are Masdevallia floribunda, striatella, kuhniorum, bicolor infracta, rima rima alba, bangii, minuta, attenuata, and echo. Other Masdevallias, including Draculas, prefer night temperatures from 40-60 °F. and day temperatures not reaching much above 75-80 °F. Remember, the colder you grow them, the sturdier the plants will be. Also, flowers will develop over a slower period giving you a larger size bloom as well as better color and shape. During summer it is almost inevitable that there will be some hot spells, sometimes lasting several weeks. When this occurs the plants will be stressed. Keep the plants shaded, reducing leaf temperatures. Keep the humidity high, at least 70%, and provide plenty of air movement. We have found that if you keep the plants drier at the roots during hot spells you will avoid stem rot, which can occur very quickly and devastate newer growth and sometimes the entire plant. Misting the leaves lightly will keep them from shriveling. Once temperatures begin to cool off, resume regular watering. Very often during stressful heat waves you will notice, especially with Draculas, some leaf tips turning brown or becoming lightly spotted. This is generally stress-related and will stop once normal conditions resume. In greenhouses, grow the plants as close to the evaporative coolers as you can. If you don't have a greenhouse, grow your plants in an air-conditioned room or in a basement under lights. In nature, these plants grow in areas that are very shady, around 1200 foot-candles (phalaenopsis light) and also in areas with fairly high light, in excess of 3500 foot-candles. Plants with heavier, thicker leaves generally need more light (cattleya light). Those with softer, thinner leaves prefer shadier conditions. Be careful in the summer not to overexpose the plants to light. Like all orchids, Masdevallias and Draculas like clean water. Only distilled, rain water or reverse osmosis water should be used. If you examine their roots you will discover many fine hairs similar to root structures on Paphiopedilums. It is best to water these plants as they approach dryness. Thick, heavy-leafed plants prefer a little dryness at the roots. Thin soft-leafed varieties do not, unless there is heat stress as mentioned earlier. The best medium for these plants to our knowledge is New Zealand sphagnum moss. When using sphagnum it is important to check for mix decomposition after 9 months to a year and repot if necessary. Bark mixes also work, but they tend to dry out very quickly, especially in the summer. Sphagnum holds an incredible amount of water, yet remains springy allowing air to pass through the medium. It is very easy to check your root systems in sphagnum because you can pull out the root mass that is holding the moss together. For tap or well water, fertilize lightly at ¼ to ½ strength Grow More 20-10-20 every two to three weeks.